THE GOING gets only a little easier as the Halifax-Huddersfield Union’s team bid to get off the mark at the second attempt this season on Sunday. Frank Greaves’ men went down 23-13 away to champions Sheffield on May 20 and their next opponents are the 2017 runners-up Leeds. Leeds won their first match and haven’t won the league since 2005. Their team manager Nigel McKee is reported to have said that is poor for a district so large. 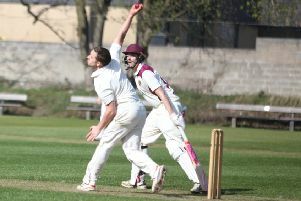 Greaves has drafted in former Crow Nest Park Junior Captain James Edwards, now at Fixby, after his fine perfomances for the Union junior team and his victory in the Hawksworth Trophy at Bradford. Adam Robinson has withdrawn pending the birth of his first child and captain Graham McLean is resting himself. These two make way for Edwards and in-form Tom Calvert. Halifax-Huddersfield: Aaron Schnacke, James Edwards, Tom Calvert and Josh Morton (Huddersfield), Isaac Turner (Woodsome Hall), Tom Hunt and Joshua McAspurn (Meltham), Scott Minto (Hanging Heaton), Matthew Colcombe (Longley Park), Sam Bridges (Bradley Hall), Jamie Smith and Mark Birkett (Halifax).